Some recipes just happen (like this one). We had some leftover greens and a ripe mango and had just made some super saucy tempeh. I realized all that was missing was a little peanut dressing, and just like that, we had a delicious side on our hands. Bonus? It looks (and tastes) like a rainbow. Care to make this easy 15-minute recipe with us? Gather your supplies and let’s make something tasty. 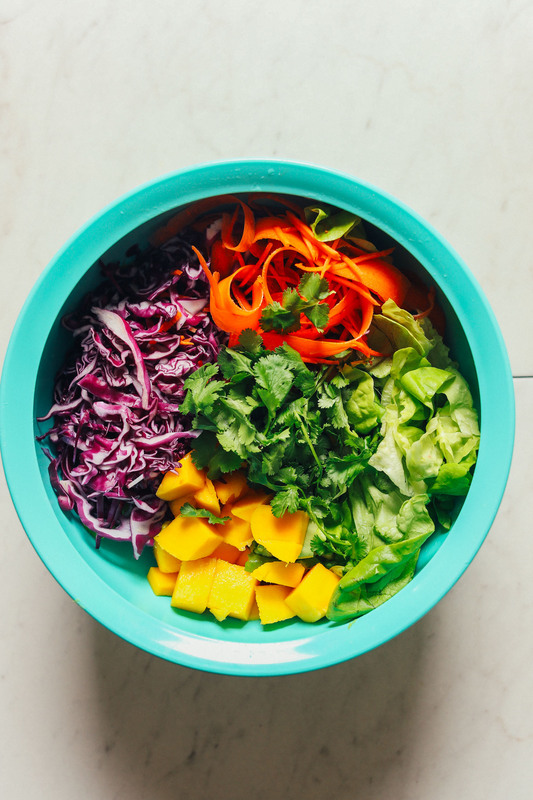 The base for this salad is greens, cabbage, cilantro, carrots, and ripe mango. That’s basically it! So fresh, so colorful, so…easy. For dressing, the only flavor that made sense was peanut butter. 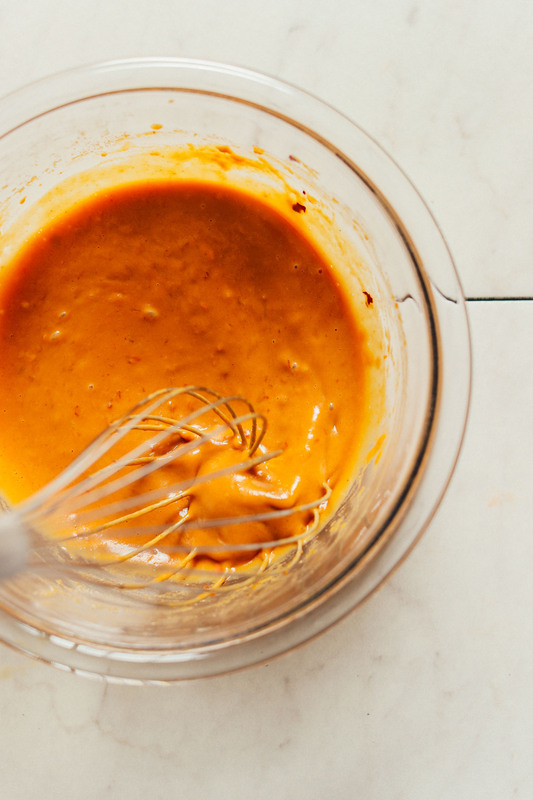 We went for a quick-and-easy peanut dressing, but you can also jazz it up with some freshly grated ginger or sub the peanut butter for cashew or sunflower butter. 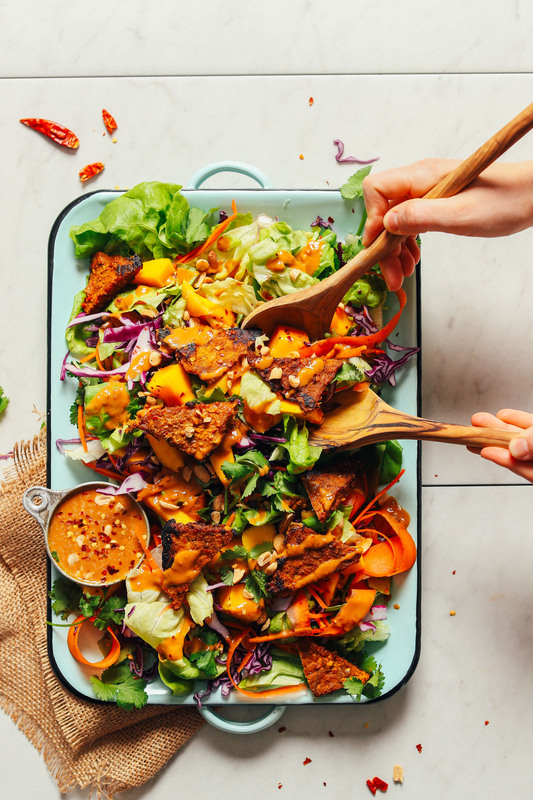 Enjoy this salad as is or top it with our Peanut & Lemongrass Tempeh Satay or 7-Ingredient Marinated Peanut Tempeh. It’s delicious on its own, but it also pairs well with dishes like our Thai Yellow Coconut Curry with Mango, Noodle-Free Pad Thai, Creamy Thai Carrot Soup, or Thai Noodle Bowls. If you try this recipe, let us know by leaving a comment and a rating, and don’t forget to tag a photo #minimalistbaker on Instagram. Cheers, friends! 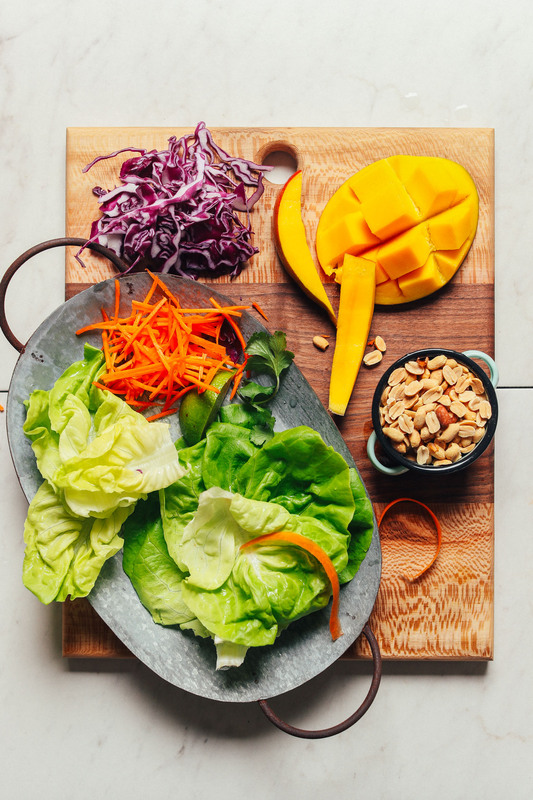 A quick-and-easy Thai-inspired salad with fresh vegetables and mango! Drizzle on a simple peanut dressing for a delicious side, or add a protein of choice to make it an entrée. Wash and dry butter lettuce and then tear or chop into bite-sized pieces. Add to a large mixing bowl with carrot, cabbage, mango, and cilantro. To prepare dressing, add peanut butter, lime juice, maple syrup, chili garlic sauce, and coconut aminos (or tamari) to a small mixing bowl. Whisk until smooth, adding water as needed to thin (see photo). Taste and adjust flavor as needed, adding more maple syrup for sweetness, chili garlic sauce for heat, lime for acidity, or coconut aminos for overall flavor. If it becomes too thin, thicken with more peanut butter. If too thick, thin with a little water. Divide salad between serving dishes and serve dressing on the side. Enjoy as is or garnish with peanuts, cilantro, and tempeh (optional). Best when fresh. Store leftover salad (separate from dressing if possible) in the refrigerator up to 3 days. Dressing will keep up to 5-7 days. *Can sub 2 Tbsp tamari or soy sauce per 3 Tbsp coconut aminos. *Find the Peanut Tempeh recipe here. So easy, and soooooo delicious! Thank you! Made this delicious vibrant salad for dinner last night. Super easy and tasty. I had to sub the chili sauce for ketchup and chili flakes as I didn’t have any and subbed Lemon for the Lime and it was still super yummy. Thank you for sharing your wonderful, healthy and beautifully colored recipes. This salad is wonderful! It’s one of my favorites that I’ve ever made off of your site! I topped it with some grilled turkey breast and its the perfect al desko lunch!
! It was delicious!!! Will finitely make this again. I made this last night and it was delicious! Dana, I love the incredible spices that you use in your recipes. Thank you for creativity and inspiration! Yummmmmmmy! Great for a hot day. Skipped the butter leaf and added some steamed chicken breast. It was a big hit. My 2.5 year old dipped his chicken in the peanut sauce and had mangos on the side! 5 out of 5 at my house. Glad you enjoyed these, Hanni! How long does the dressing keep for? Hi David! The dressing will keep up to 5-7 days. The colors, flavors and textures are fabulous! Will definitely make it again – maybe with the tempeh ? THANK YOU FOR MAKING MY VEGAN LIFE THE BEST LIFE! So kind! We are glad to hear it, Michelle! This salad was awesome! I marinated tempeh in the salad dressing for 24 hrs, sautéed in sesame oil and mix in salad. AMAZING!! 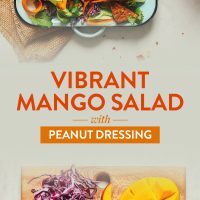 Made this over the weekend for my family for lunch on a hot summer day, the mangos were so refreshing and the peanut dressing was an absolute crowd pleaser! Paired it with Cajun spiced tilapia. Thanks so much for the recipe! Yay! Thanks for sharing, Justine! I’ve made this twice already, and highly recommend it! I didn’t have the chili garlic sauce and used cashews instead of peanuts, and it was still delish. Love this recipe. I have made it three times now. My favorite summer salad. I made this and I loved it! I had to incorporate some minor changes: I used romaine; I did not have the chilli sauce so I added fresh garlic and hot pepper flakes to the dressing; and I used crunchy peanut butter. It was a great salad! My husband doesn’t particularly like “sweet” meals, but he was ok with this one, because he loves peanut butter! I had some extra salad mix, which I refrigerated and used it 2 days later. I just had to prepare the dressing again. So next time, I’ll prepare dressing for more servings! Thank you! This salad was DELICIOUS! I didn’t make the tempeh to go with it as the only tempeh in the house was in the freezer and I didn’t want to take the time to thaw it out. Instead we made the almond butter tofu from the noodle bowl recipe, which went incredibly well. Seriously yummy salad. Will put it on repeat this summer. Made this for dinner last night and it was great! I had all the ingredients except the coconut aminos and had to run to Trader Joes to buy some (it was also my first time using it). I loved it! The coconut aminos was great and I will definitely be using it as a substitute for soy in a lot of sauces. Great recipe! Glad you enjoyed it, Anna! OK, i love your recipes, they are easy to make and flavorful and what drew me in was partly the tempeh in the pictures. You start the recipe with 15 min, quick and easy but ehem I went looking for the tempeh recipe, it actually calls to be marinated for over 24 hours! I found this disappointing and a bit misleading. Hi Claudia! Thanks for feedback! While this recipe is a 15-Minute recipe once the tempeh is prepared, we appreciate hearing from you and will take this into consideration for the future. I made this for my vegan daughter and me. I also made the lemongrass tempeh. Wow!! This was so delicious! I couldn’t keep my fingers out of the lemongrass marinade. We had the salad for dinner two nights in a row and I wished I’d had made enough for a third. Excellent recipe. I had a little extra marinade so put some chickpeas in it and we ate that yesterday. Lovely! Thanks fro sharing, Michelle! There’s something I have to admit: I never tried tempeh before!!! It’s a bit embarrasing, however, you’re fanastic, rainbow colored salad is the perfect way to give tempeh a try. 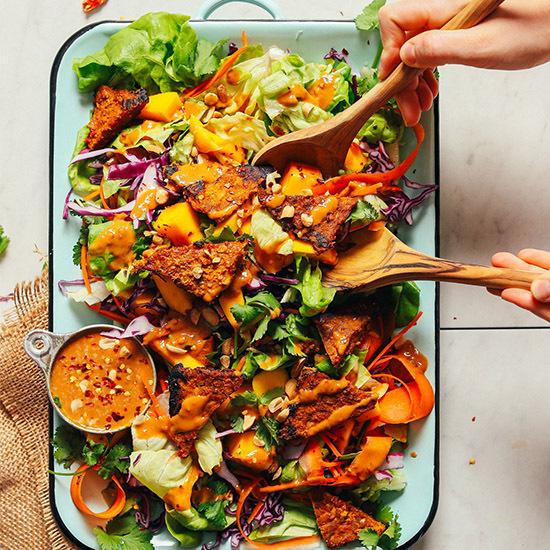 I love everything about that salad and tempeh sounds pretty tasty, so I think I’ll have a great time preparing it (working with all those colorful veggies just makes me happy) and eating it will be even better. Just made it and it was epic! Exactly what all the mangos in the grocery store needed to be exciting. I used peanuts (instead of peanut butter) and just added them to the food processor with the rest of the dressing ingredients. I also simply sautéed some tofurkey tempeh bacon, instead of making the peanut one and added it in each plate. I will absolutely make it again — thank you! We had this amazing salad for dinner tonight, my husband and I loved it!!!!! We live on Maui, so it’s mango season:) Thank you for all of your delicious recipes! Jealous! Maui is so gorgeous. So glad you enjoyed it! What a lovely salad! I love adding lots of cabbage and fresh lettuce into my Thai salads. What other kinds of lettuce would be suitable for this salad? Just happened to have all these ingredients already at home! Love this recipe, but wish I already had some of the tempeh ready! Geez. Thanks so much for this delicious salad. So kind of you to share your chef talents with the world. I’m looking forward to making this salad! I also want to tell you that your food photos are absolutely STUNNING!!! Looks delicious. I love all your recipes. Do you think I can use powdered peanut butter on this recipe to save calories and fat? We haven’t tried, but I would think that should work! Report back if you give it a try! What kind or brand of chili garlic sauce do you use?